When life begins to take me to school I feel like staying home sick. Especially when I know I’m repeating a course that I’ve failed before. Meeting the steep uphill parts of life gets frustrating and makes more than just my calves hurt. What changes if I began to think VERY DIFFERENTLY about the uphill portions? If I turned the tables on the difficulty and the frustration and the UP-HILLNESS of it and said, “there has to be a better way, a way up and over, and finally through”. I don’t have to be like the Donner Party trapped for months on end by circumstances. Growing weaker every day. More discouraged. A perpetual prisoner. If I can’t get out of it, then I’m determined to go ahead through it. Have you noticed that as God’s children we are not immune to difficulties and problems? But God knows we need the UP-HILLNESS sometimes. He’s included it in the divine road map He’s made for each of us. But He’s not toying with us. The photo/saying I made for this post looks like a road, but it’s really a wall. 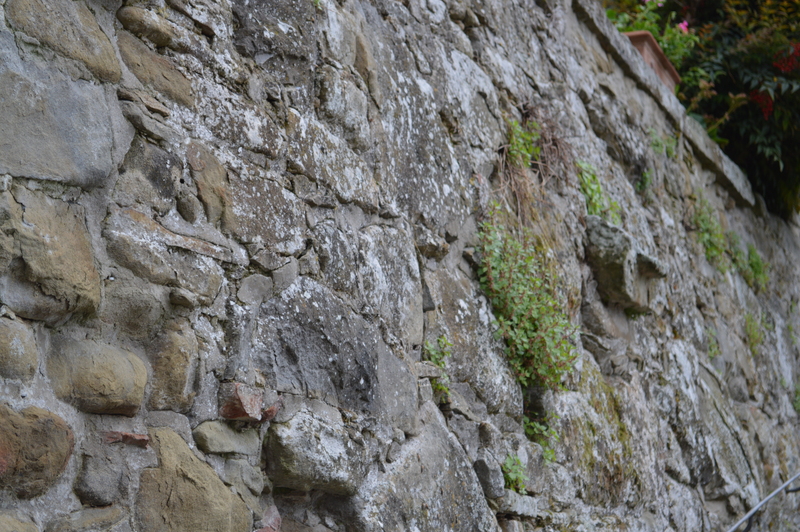 I took a close up of it looking up the wall to capture the moss and grasses clinging tenaciously to the old stones. ~ A barrier that keeps us from making any forward progress. ~ A ladder to a higher place, and possibly a wider space. Where do we get the strength to scale the wall, to use it as a ladder and by scaling it end up on a higher level? 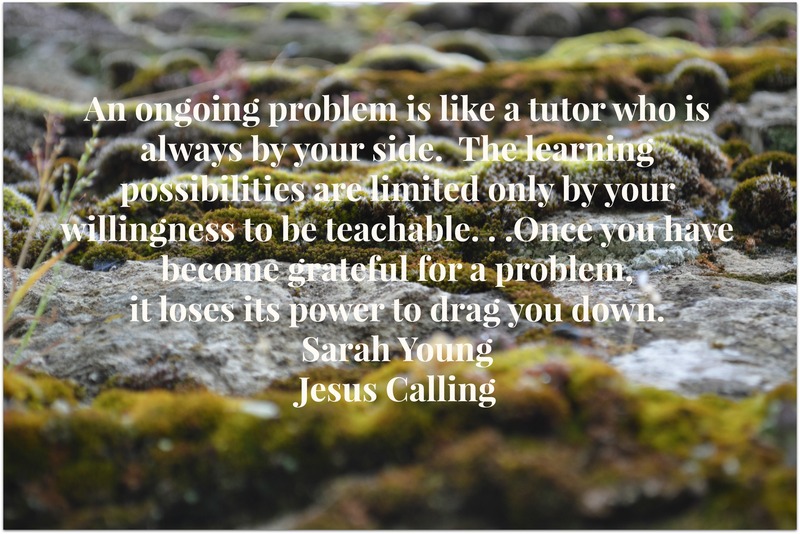 Sarah Young suggests we start with gratitude. To thank God for the tutor and the lesson. And the companionship of a personal God who has promised to be there with us as we gather to ourselves all the Jesus-likeness we can from the experience. I love that verse! Never read it in the Message. It is quite good. Gratitude always holds the key to a proper perspective. A friend shared a verse in the message and I saw a ‘new’ aspect of truth. Not a study Bible, but beautiful for inspirational reading. Ah the wall…sometimes you bang your head against the wall so much that it becomes a habit. You don’t even realize with Him you can climb up and over. You think “of course… Hello wall… Let’s resume banging my forehead against you.” Definitely needed to read this tonight. Thank you Kelly.